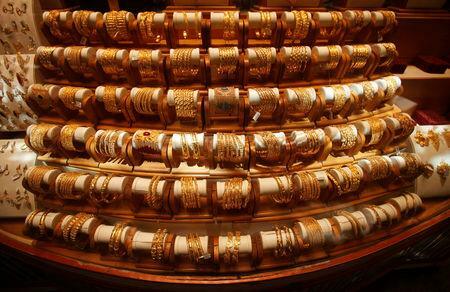 (Reuters) - Gold prices rose to a more than three-week high on Monday, helped by a weaker dollar and as worries over global economic growth pushed investors into safe-haven assets. Spot gold rose 0.7 percent to $1,322.7 an ounce by 1:56 p.m. EDT (1756 GMT), its highest since Feb. 28. Last week it posted its third consecutive weekly gain, rising about 1 percent. U.S. gold futures settled 0.8 percent higher at $1,322.6. Palladium was up 0.8 percent at $1,576.16 an ounce, silver gained 1 percent to $15.56 and platinum was up 1.8 percent at $859.09.